The facts tell a very different story. U.S. agriculture is not feeding the world’s impoverished and desperate people, according to a new EWG analysis of trade figures. Eighty-six percent of American agricultural exports in 2015 went to 20 of the world’s wealthiest and most developed export destinations, including Canada, China, Mexico and the European Union. Weir Schechinger’s analysis determined that the 20 export destinations that consumed the vast majority of America’s agricultural bounty scored medium, high or very high on a development scale created by the United Nations Development Programme. None had large numbers of hungry people. Half of all U.S. exports going to these relatively affluent nations consisted of meat and dairy products, and animal feed. The EWG report soundly debunks the myth promulgated by the agribusiness lobby that a hungry world is counting on U.S. farmers to double their production, to meet a U.N. projection that world food production must double to feed a global population of 9 billion people by 2050. Only half of 1 percent of U.S. agricultural exports last year went to 19 nations, including Haiti, Yemen and Ethiopia, that the U.N. Food and Agriculture Organization determined had very high or high undernourishment. The value of U.S. food exports to the top 20 wealthy destinations was 158 times the exports to the 19 most seriously undernourished countries. Even more striking, between 2004 and 2013, U.S. exports and food aid combined contributed between only 2 to 4.4 percent of the food supply of those 19 undernourished countries. Enterprising U.S. farmers are skillfully marketing their products to a growing population of middle-class people overseas, who can afford a more diverse diet, including more meat. But exploiting business opportunities shouldn’t be confused with the moral imperative of feeding hungry people. It shouldn’t be used to excuse the damage all-out production is doing to American public health and the environment. “Modern” farming systems that depend heavily on fertilizers and chemicals cause considerable damage to air, water and land resources, as well as public health. Farm runoff generates toxic algal blooms and polluted drinking water that often contains numerous different pesticides. Pesticides from farm fields and antibiotic-resistant bacteria from confined animal enclosures drift across large expanses of land, threatening human health. And ending wars and conflicts. It will be a tragic mistake if the mythology about U.S. farmers and agribusinesses feeding the world distracts us from taking action that could tangibly help end world hunger. Even the poorest nations produce most of their own food. 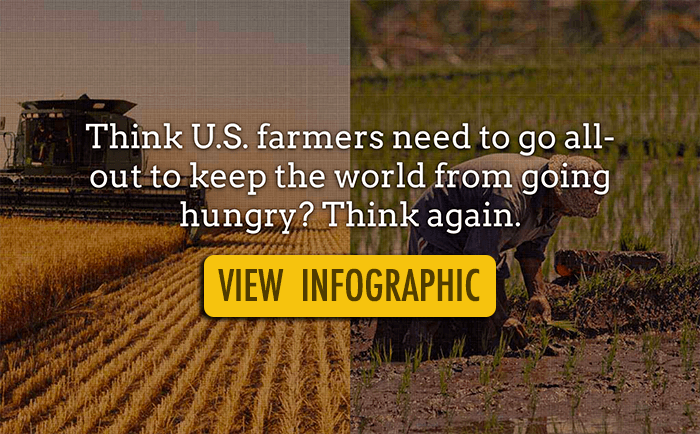 American farmers can play a crucial role by helping their counterparts in poor nations do a better job of making a good living and feeding their own people.